Unlock your best belt-singing voice with Wicked actress, singer, and voice finder Felicia Ricci. Are you a singer who's always wanted to learn how to belt -- but you've been told it's "unhealthy"? Time to unlock your most powerful voice. Voice Finder & Broadway actress Felicia Ricci will teach you the simple, easy, techniques behind belting -- and show you that anyone can belt. "I'm Ready to Belt My Face Off!" 36 voice lessons. 4+ hours of video. Belt Your Face Off! is a complete singing course that gives you ALL the tools you need to learn how to belt sing powerfully & consistently. Belting is a singing style practiced by pop singers, rock stars, and Broadway performers in which chest voice is applied to a high range of notes. It's one of the most fun and impressive singing sounds out there -- but one that often stumps singers who think they just don't have the "gift" or talent to do it. Fact: Healthy belting can be taught. And all the keys to learning are contained in this course. This complete A-to-Z course offers a carefully planned sequence of belting warmups and techniques designed to transform your voice with the effectiveness of one-on-one teaching. Under the guidance of Felicia Ricci -- who honed her belting craft while playing the lead role of Elphaba in the Broadway tour of Wicked the musical -- these lessons will leave you in tip-top singing shape, armed and ready to belt healthily and wow everyone at your next audition, talent show, or musical performance. These lessons were designed for singers of all levels who are seeking to master the belting technique. Felicia teaches in clear, plain language that's not overly technical or long-winded, conveying her information with tons of gusto (and humor, too!). Extremely interactive, these lessons don't just involve talking about a concept, but applying it to over 30 exercises, vocalizations, and practice sessions. Felicia stays with you every step of the way, finding creative ways to get you to access your best voice. (1) Breath: What is breathing from the diaphragm, and how do I apply this practice? What vocal warmups reinfroce and hone this skill? This sequence of videos answers these questions and teaches you how to make correct, supported breathing second nature. (2) Palate + Tongue: Learn the proper positioning in the back of your throat that allows you to access your best singing and belting voice. (3) Resonance: Singing is created by breath and the vocal folds, but it resonates on different parts of your body. Learn to wield the power of resonance to help create a strong and focused belt sound. (4) Vocal Mix: What is chest voice, and what is head voice -- and what happens when you sing "between" the two? The answer is a vocal blend, or mix, which is where the belt voice originates. Learn the vocalizations and approaches that will get you to have a seamless, beautiful blend. (5) Advanced Techniques: Watch as your belting voice starts to soar! Practice these warmups, apply focused techniques, and listen as your belt voice develops healthily and free of vocal stress. (6) Applied Belting: Warm up and practice is all well and good, but what happens during a performance? Discover key strategies to keep you grounded and consistent, as well as singer "secrets" like modified vowels. (7) Troubleshooting and Tips: Ever singer's journey encounters roadblocks. In this section, Felicia addresses some of the most common challenges, offering ways to overcome these hurdles. (8) Notes on Daily Practice: Singing everyday and working toward incremental goals are key to belting success. In this video, Felicia outlines the ideal practice session and coaches you on developing your own individualized singing regimen. Each of the above course units is accompanied by warmup and exercise videos (homework) that guide you through your take-home assignments (no piano required) and allow you to execute the lessons in your own voice. Audio downloads isolate and extract each vocal warmup and exercise so you can put them on your music player and practice anywhere, antime. Written guides, summaries, and introductory e-book reinforce each concept and give you a handy reference of key points and principles so you'll never feel lost. A vocal warm-up log lets you keep track of each exercise and lists its exact video location, allowing you to find and repeat as many times as necessary. Choose the payment plan that works for you. When I was cast in the Broadway tour of Wicked, going on for the lead role of Elphaba about twice per week, I had to learn how to sing my incredibly high, powerful belter songs consistently and without strain. During the seven years since then, I've pulled together everything I've learned as a singer and international voice coach to develop a safe, healthy sequence of exercises and warmups that allow you to build an incredibly powerful belting voice -- that "wow-factor" sound that's so popular today. I know firsthand what it's like to invest lots of money in private voice lessons, with little to no result. I want you to get results from Belt Your Face Off! -- guaranteed. Which is why the course comes with a no-questions-asked 30-day refund policy. Check it out, see if it clicks, and if not, you get all your money back. I want you to feel empowered to sing any vocal role, and not feel limited by your range or confidence as a belter. 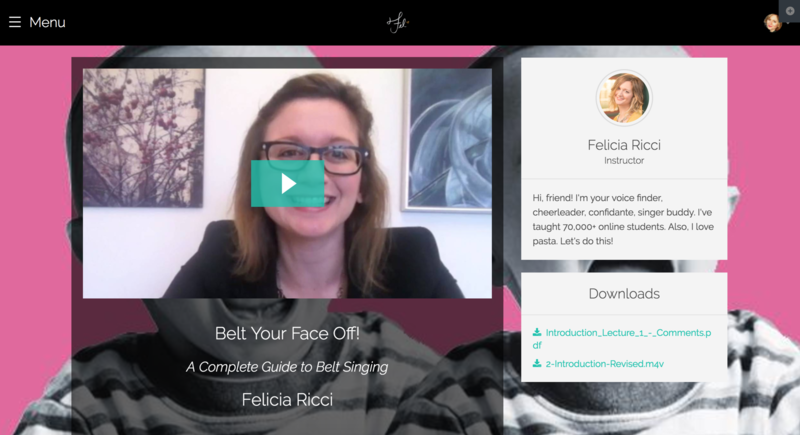 As a student of Belt Your Face Off!, you will get lifetime access to the course, including a comprehensive 41 page singer manual and searchable Q&A document. I never want you to feel lost, or like you don't have the tools to belt sing. It's time to bust through those walls and get that belting sound you always wanted but never thought was possible. Does the idea of being able to belt sing make you super psyched? Then I'd be thrilled for you to join my course! Let's do this. Let's belt our faces off!